My name is Lisa Lyhne Larsen and I live in Germany, however, I am a Danish citizen. I speak German, Danish, and English fluently. I like math and physics and have taken advanced math courses at the Heidelberg Business School. I am very excited to learn more about Mathematica. This is a 2,000-year-old Roman game that allows two players to remove each others' stones by creating "mills" in order to win. The game has two phases. 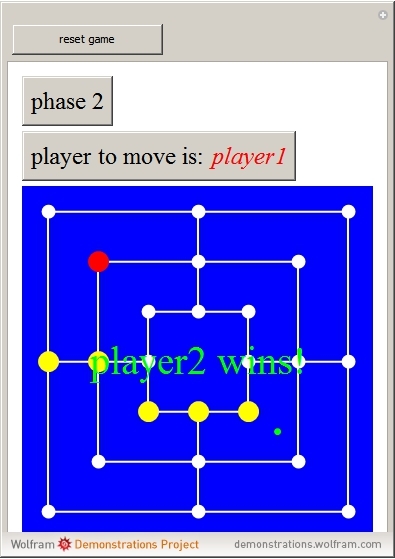 In phase 1, the players may add stones to the board, and in phase 2, these stones may be moved one adjacent space. The goal is to remove the opponents' stones to less than 3.